There are many different methods that can be used to install connectors for fiber optics. The methods were developed over time for different reasons, including convenience, reliability, installation cost and installation time. Today, let’s start with most first, and old method – Epoxy Method. The first method used for installing connectors was the epoxy, cure, and polish method. Epoxies cure either fast at room temperature, slow at room temperature, or slow or fast at higher temperatures. Epoxies have a high resistance to a wide range of conditions, resulting in epoxies providing high reliability connectors. 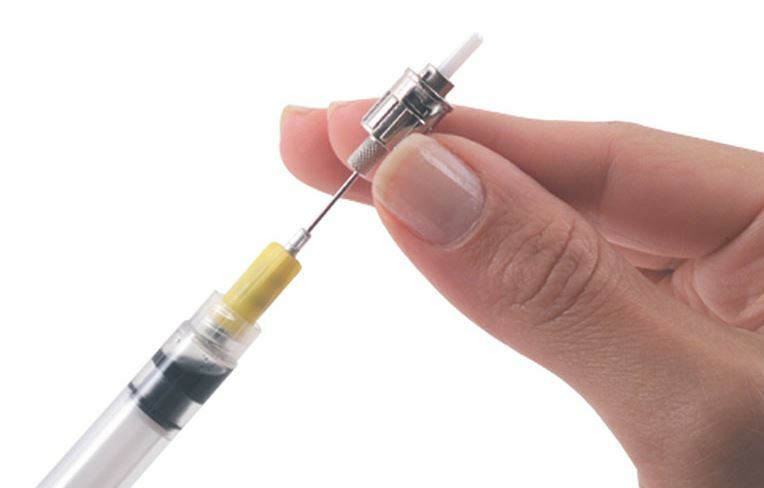 Connector epoxies for example resist degradation at temperatures of up to 105°C, while the original Hot Melt™ adhesive system was specified to only 85°C. Epoxies also provide an excellent match for thermal expansion coefficients of ceramic and fiber ferrules. This results in very little movement of fiber in its ferrules over a wide range of temperatures, resulting in steady power loss. Temperature stability test data typically indicates loss stability of ±0.1-0.2 dB over a wide temperature range. A high process yield can be achieved by using epoxies. This is a result of the bead on the ferrule supporting the fiber during polishing. This virtually eliminates damaged ends which would otherwise cause 95% of connector losses during installation. Connectors can be installed in a factory at low labor costs. The combination of low labor cost, low epoxy connector cost, and high process yield makes the use of epoxy in factory installation a firm favorite. This method does however have three disadvantages. The first two disadvantages result in high number of man-hours needed per connector installation, while the third refers to the power requirements of heat curing ovens. Using epoxy requires three steps – the mixing of two components, transfer of the mixture to an automated injection mechanism, and cleanup of excess epoxy. This results in a low installation rate of epoxy connectors, typically six to eight per man-hour, leading to a high cost for the total installation when field installation labor rates apply. Such rates are typically higher than $30/hour. In comparison, factory installation labor rates drop to less than $10/hour, and this could even be less in developing countries. In addition, the labor utilization percentage of field installers is much lower than that of factory installers. Field utilizations are typically 80% or less, while factory utilizations are more than 90%. Reduced labor utilization increases the total cost of the low installation rate with epoxy. Because of the potentially high labor cost of this method, connector manufacturers have developed other methods. Note: Yield is the ratio of the number of acceptable connectors to the total number of connectors installed.